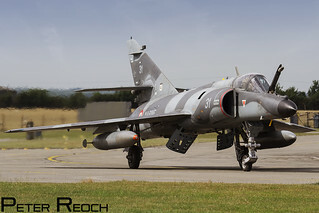 Taxying around the 09 loop at RNAS Yeovilton, one of three Super Étendard Modernisé (SEM) jets operated by the French Navy which participated in the annual Air Day. The Super Étendard is a French carrier-borne strike fighter aircraft designed by Dassault-Breguet which first flew in October 1974 and is due for retirement from French Navy service next year. Luckily the sun broke through just at the right time to illuminate this jet, with the friendly pilot extending the aircraft's refuelling probe for the photographers present.